Happy Thursday dolls! First let me start off by saying THANK YOU to everyone for the birthday wishes on my last post. I appreciate it so much! It’s been so crazy over here in Jersey lately. Last week we got a hurricane and yesterday it snowed! Yes, snow in November. Last night it covered the streets. Anyway, today is what I like to call one of my “fill in” outfits. I wonder if any of you bloggers know what I mean by this lol Sometimes I have my outfits & blog posts planned out, and other times I have no idea what I am wearing or posting until that morning. I wanted to do some layering but still make it chic and stylish. I’m actually wearing a sweater dress but I tucked it into this skirt to make it look like a top. This skirt is such a bright fun color. I wore it once in the summer, but this is a great example of how you can still rock those summer skirts into the fall season. 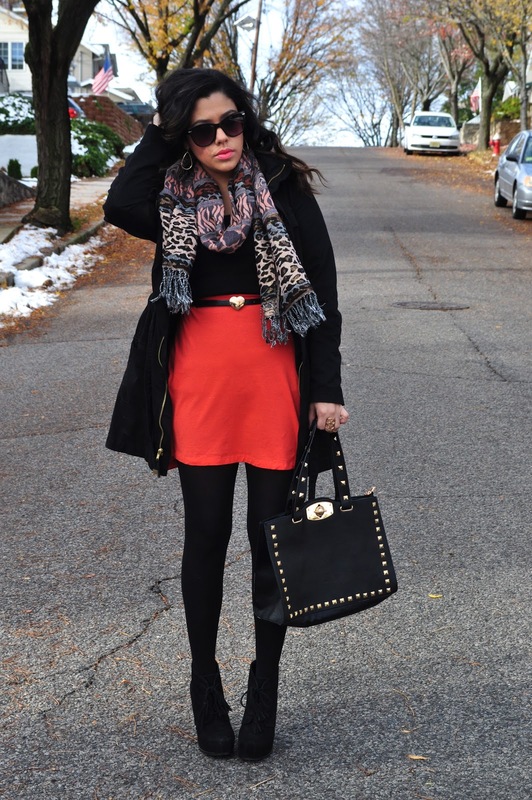 Just throw on some tights and do a little layering! To bring the whole look together I put on my favorite belt. I seriously can’t get enough of it. I wanted to add some print to break up the solid colors so I added this scarf. I love the combo! I got this parka style jacket last winter and I really love it. It can be worn casually or dressed up so it’s perfect. I’m wearing my favorite booties too! I think it might be time for a new pair. How amazing is this bag from OASAP?! I am kind of obsessed with the gold pyramid studs and twist lock. It can be worn as a handbag and it also comes with a strap so you can put it over your shoulder. It’s a great statement piece to add to any outfit. Gold details are my favorite! You can check out more details on this fab bag here! I hope that you liked today’s ensemble! If I don’t get to post tomorrow, enjoy your weekend my loves. Saturday night I’ll be going out for dinner and drinks to celebrate my birthday with my friends. Really looking forward to it! Check out my new youtube video: 9 WAYS TO WEAR A SCARF! I hope that you all have an amazing day! you look amazing!!!!! i cant wait to be in atl with my family for xmas so i can wear some major fall outfits like this one. lol its still hot here in fl. Love this! Such a pretty skirt! Great for the upcoming holidays! 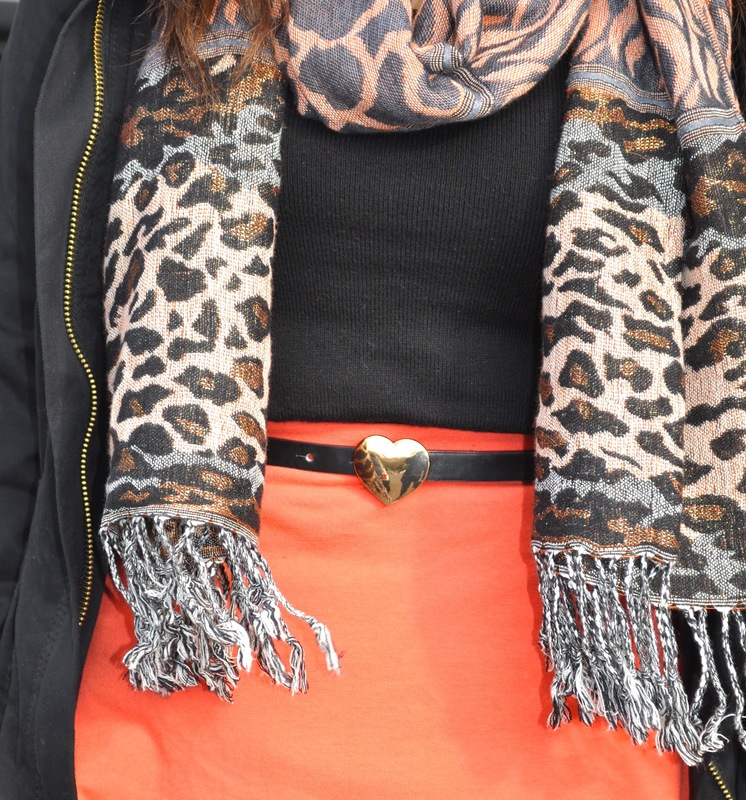 Love how the scarf has hints of peach in it to blend with the skirt. And the bag is edgy, I like it! lovely outfit love the pop of color with the skirt sooo cute! Loving the layers, so gorgeous! Love the entire look! It's perfect! So pretty! 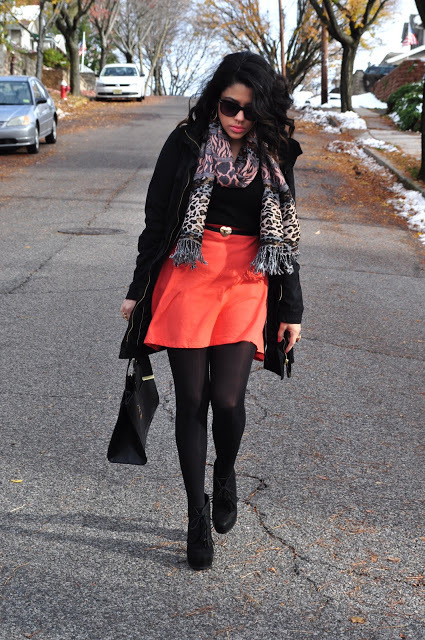 Love your orange skirt! Hi! Lovely outfit, I really like the shoes. I love the color of your skirt, it's the perfect pop for this outfit. Your scarf is SO cute too. You look beautiful! Love your layering techniques and that heart belt adds such a sweet touch! Those are some killer heels too – you're totally rocking this look! I can't believe it's snowing in Jersey right now, here in NC it's a day above 70 degrees! Love your shoes!! And bag! Very well done! Love the pop of color 🙂 great outfit for this season! Love this look Naty! the pop of color is perfection! You look great girl! Love the studs and the color of your skirt. Nice blog, want to come by on mine, maybe we could follow each other? ps. follow each other ?